Are you looking to turn more Facebook lurkers into fans of your page? There’s no better way to do this than with a custom Facebook landing tab. As interest in Facebook marketing increases, marketers are looking for new ways to improve their technique. If you’re a regular reader of Social Media Examiner and also visit our Facebook Page then you’ve already heard about creating custom tabs using Facebook’s Static FBML for engaging first-time Facebook visitors. 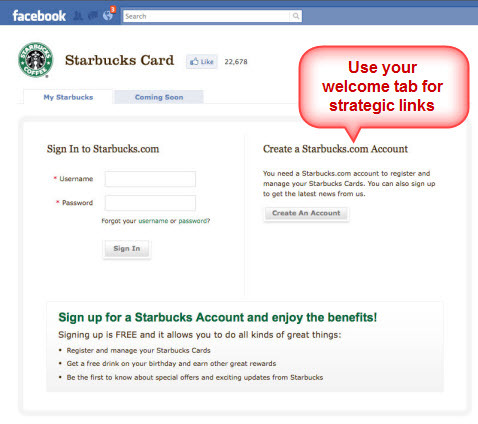 Here are eight different ways businesses are using landing tabs on Facebook. Your landing tab is a great place to ask first-time visitors to “Like” your page and grow your Facebook community, just as Apryl Parcher does here. 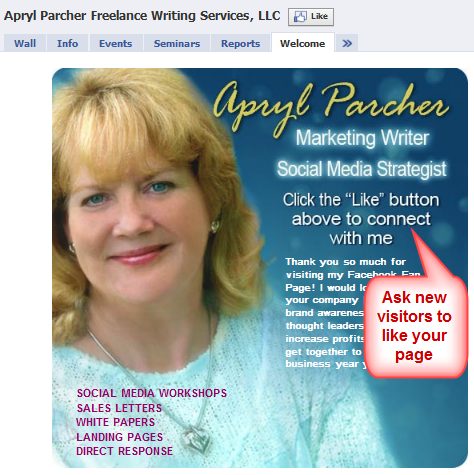 Notice how Apryl Parcher asks new visitors to like her business page to grow her Facebook community. Long tab. A long tab where new visitors have to scroll down several screens to see everything is not always a good choice, but it can work for some businesses. Multiple opportunities to engage visitors. There’s a poll, a game, an invitation to share photos and three other ways to engage with Starwood. Geo-targeting. It’s interesting to note that Starwood Preferred Guest uses Buddy Media’s new Platform +GLOBAL application where visitors “are served a customized page based on the language and country settings within their Facebook profile.” The customization obviously also uses the IP address, because I’m based in France and as you can see below, the “Like” button is in French even though my Facebook preferences specify English. 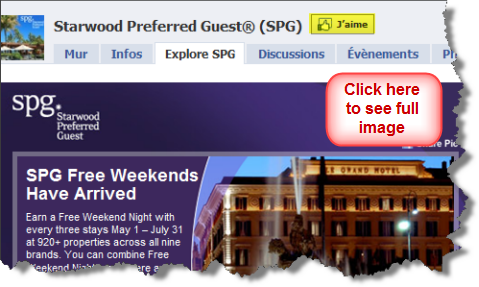 Starwood Preferred Guest's Explore SPG tab gives many options for visitors to interact with them. CLICK IMAGE TO SEE IN FULL. Here’s another interesting way to maximize your landing tab. 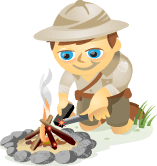 The Facebook application TabSite allows you to make a separate navigation bar within a Facebook tab you create using Static FBML. 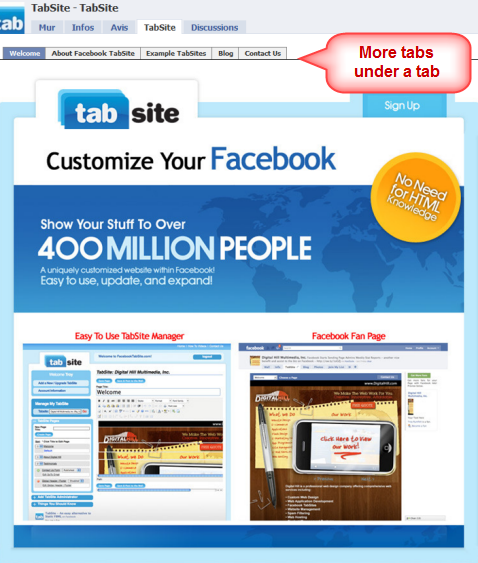 TabSite offers a solution for business pages that need extra tabs. 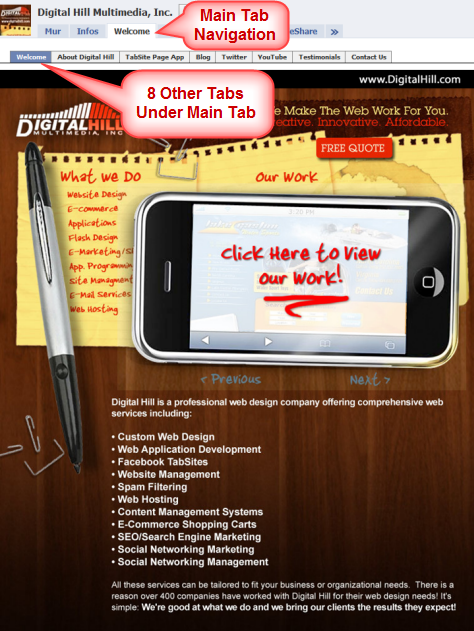 See below how Digital Hill Multimedia uses their new tab setting. It’s interesting to note the choices Digital Hill Multimedia made when selecting what to put on their main Facebook navigation bar compared to what’s in this secondary navigation bar created with TabSite. See the eight tabs below the main landing tab in the main navigation bar. The Volkswagen Facebook page used promotional videos related to the recent World Cup. Combining promotional materials with current events is a marketing tactic that can work well on your landing tab too. 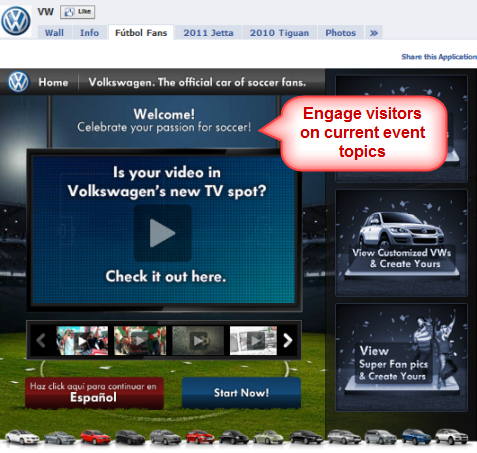 Volkswagen uses slide navigation with a selection of promotional videos. Starbucks has a link on their landing tab that launches an application to manage your Starbucks account. Starbucks uses their landing tab to link to their custom application. Best Buy sends new visitors to a “Shop & Share” tab where they make it easy to access different categories of their shopping application. 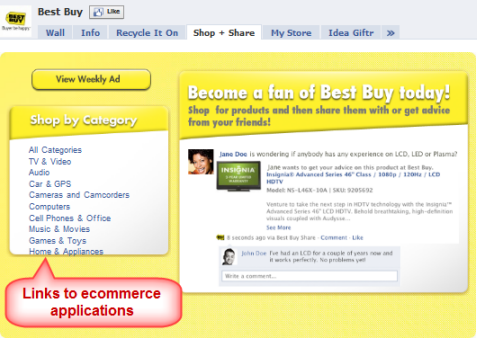 Best Buy asks new visitors to become a fan, incites engagement and provides an easy access to get straight to their shopping application. 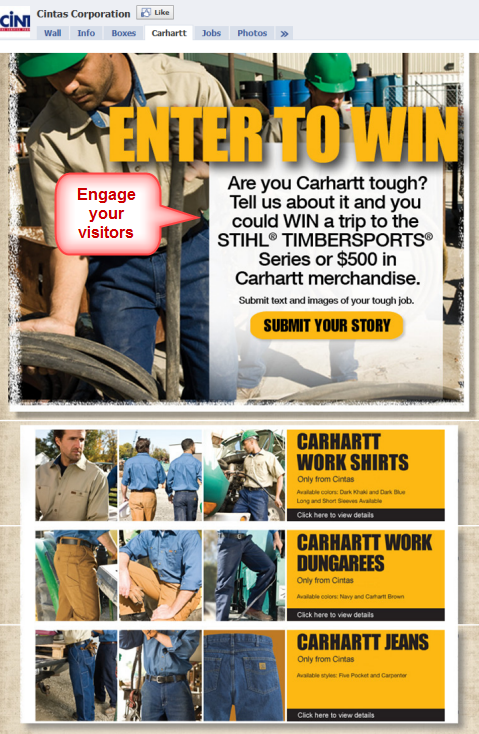 Cintas Corporation invites all new visitors to tell them about their tough job and send in photos to win prizes. Cintas Corporation does a good job at inciting interaction and building community. UPDATE SINCE PUBLICATION: Facebook is likely to phase out the boxes tab down the road, so we advise you transition over to creating a custom tab using Static FBML. 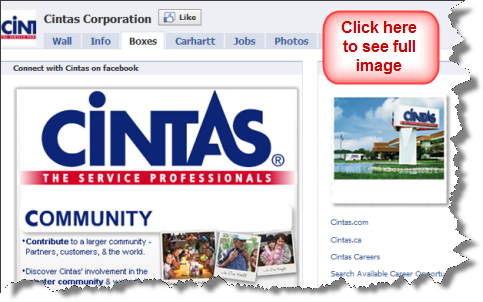 Prior to creating their landing tab above, Cintas Corporation directed all of their new visitors to their “Boxes” tab. If you find it challenging to set up a specific Facebook tab using the Static FBML application, this may be the solution for you. Facebook pages come with a “Boxes” tab and they are easy to use. It’s interesting to compare this long Cintas Corporation tab created in a “Boxes” tab with the long Starwood Preferred Guest “Explore SPG” tab created in FBML above. Cintas Corporation created a very long landing page by simply using the "Boxes" tab. CLICK IMAGE TO SEE IN FULL. Here are a few more Facebook pages with interesting landing tabs. Threadless is a great example of how to use the “Like” button on a tab. Revision Eyewear has a presentation of their products made in Flash. Harley Davidson has a variety of links on their landing tab pointing back to their own website. Social Media Examiner uses a “landing” video. 1-800-Flowers has a clear call to action. What do you think about custom landing tabs? Please share the links above and tell us what you like most about them. Leave your comments in the box below.